As we know from Seinfeld, salsa is the number one condiment in America. Why? Because people like to say…salsa. And also, it tastes good. 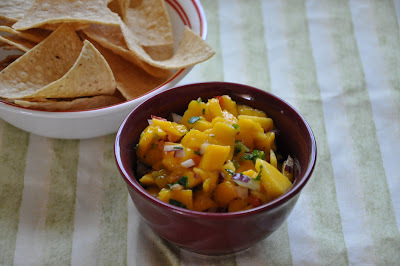 This sweet and spicy mango salsa uses Fresno and scotch bonnet peppers. It’s great on tacos, especially with pork, and of course it makes a nice companion to savory salsas when snacking on chips. Adjust the amount of heat in the recipe if you like; the proportions here are for a medium-hot salsa. I find it easier to get the peppers at the right size by using a small food processor, but everything else gets chopped by hand. Mix all ingredients in a bowl—chill if desired, but the flavor is better at room temperature. 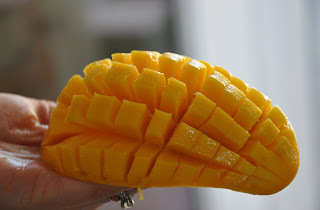 *A tip from Beta Wife: For a super easy way to peel & dice a mango, slice the unpeeled mango in half lengthwise, just skimming the pit. 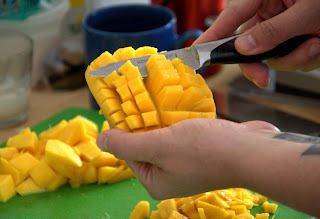 Then with each half still in its skin, cut the mango into cubes; cut through the fruit, but stop just short of the peel. Turn the mango inside out, and gently cut the flesh from the peel. **The scotch bonnet is pretty damn hot—it’s related to the habanero, but has more flavor than heat.